Waddell (DDG-24) was laid down on 6 February1962 at Seattle, Wash., by Todd Shipyards Corp.; launched on 26 February 1963; sponsored by Mrs. Howard W. Cannon; and commissioned on 28 August 1964, Comdr. Carl J. Boyd in command. Following trials from October 1964 to May 1965, the new guided missile destroyer conducted shakedown off the west coast into July, before she participated in antiaircraft and electronic warfare Exercise "Hot Stove" from 26 August to 3 September. During this time, while serving as plane-guard for Ticonderoga (CVA-14), Waddell rescued Comdr. C. H. Peters, whose plane had ditched off the coast of southern California. On 28 September 1965, Waddell-in company with Ticonderoga and three destroyers, and acting as flagship for Commander, Destroyer Squadron (DesRon) 132-departed her home port, Long Beach, Calif., bound for her first tour of duty in the Western Pacific (WestPac). After stopping at Pearl Harbor, she proceeded on toward the Philippines. On 7 December, Waddell steamed alongside Sacramento (AOE-1) conducting an underway replenishment on the oiler's port side; while Brinkley Bass (DD-887) replenish to starboard of the oiler. During the operation, Brinkley Bass reported a man overboard; and Waddell executed an emergency break-away and doubled back to pick up the man. Upon completion of this SAR tour, the destroyer sailed via Sasebo to Buckner Bay, Okinawa. She conducted a missile shoot in Ryukyu waters and then visited Hong Kong. On 31 January 1966, she sailed for Danang, en route to a second deployment to the northern SAR area. The following day, after receiving fuel from Sacramento in an underway replenishment while on station, Waddell collided with Brinkley Bass. The damage which Waddell sustained forced her to return to the Philippines for repairs. Back in Vietnamese waters in late February, Waddell provided gunfire support in the III Corps operating area from 27 February to 11 March, as part of TU 70.8.9. She then returned-via Subic Bay, Guam, Midway, and Pearl Harbor-to her home port, Long Beach, where she arrived on 8 April. Following a yard period-during which the ship underwent structural repairs-Waddell participated in various fleet and independent exercises off the California coast. Two days after Christmas of 1966, the ship got underway for another WestPac deployment. Early in 1967, Waddell was again busily engaged off the Vietnamese coastline. From 2 March to 21 May 1967, the ship displayed "exceptional readiness and effectiveness in all tasks assigned," including gunfire support off South Vietnam; interdiction of North Vietnamese supply traffic along the coast; and gunfire against selected targets in North Vietnam. Coming under hostile fire from shore on one occasion, Waddell returned the fire and inflicted maximum damage on enemy shore batteries while emerging without harm. 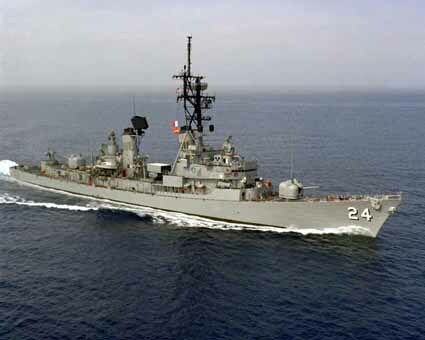 During her second WestPac deployment in Vietnamese waters, the destroyer fired some 2,000 rounds of ammunition while winning the reputation of being "the busiest ship in the Tonkin Gulf" before heading home. She returned to WestPac that summer-with logistics stops at Pearl Harbor and Midway en route-and arrived at her new home port of Yokosuka, Japan, on 1 August 1968. She conducted three tours on the "gun line" off North and South Vietnam into the fall, as well as one tour as plane guard for the attack carrier strike group based around Coral Sea (CVA-43) and Ranger (CVA-61). After completing an overhaul at Yokosuka toward the end of December 1968, Waddell got underway on 7 January 1969, bound for the "gun line." Between 17 and 30 January, she fired two gunfire support missions in the I Corps area for the Army's 101st Airborne Division and one for the 7th and 9th Divisions of the Republic of Vietnam (ARVN) units. After a quick trip via Buckner Bay to Yokosuka, Waddell sped back to the "gun line" in late February and resumed her gunfire support duties on 1 March. There, in the II Corps area, she fired 12 support missions with Task Force "South." She subsequently conducted 79 more gunfire support missions including 12 for Australian units, 11 for ARVN units, and 15 in support of Operation "Sheridan"-in which the United States Army 101st Airborne and an ARVN regiment participated. Returning to the "gun line," Waddell then lobbed shells at Viet Cong (VC) camps and infiltration points from waters off Phu Quoc Island in the Gulf of Siam in support of Operation "Javelin," before she was assigned to the Mekong Delta region. There, supporting two ARVN divisions, she conducted 19 bombardments against VC structures, bunkers, rest sites, and supply routes. Subsequently returning to "Yankee Station," she screened Enterprise (CVAN-65) in June, as the big carrier conducted strike operations, and returned to waters near the DMZ in mid-July for gunnery support duties. In 1970, Waddell's home port was again changed- this time to San Diego, Calif. During her next WestPac deployment, the destroyer continued her busy task of supporting ground units and standing by as a plane guard and a picket destroyer on "Yankee Station." In addition, she conducted occasional surveillance missions, watching Russian warships operating near the American task forces on not-so-subtle intelligence gathering missions of their own. One such mission took place as the Russians conducted Operation "Okean" in the Philippine Sea. Hostilities between India and Pakistan had caused the flurry of activity, as contingency plans were drawn up to rescue Americans caught in the area, if the need arose. However, the crisis soon passed; and Waddell returned to Subic Bay on 15 January 1972. Two days later, the ship was picked to represent the United States at the Imperial Ethiopian Navy Day celebration at Massawa, Ethiopia. After hasty preparations, Waddell stood out of Philippine waters and entered the Indian Ocean soon thereafter-for the second time in a fortnight. From 3 to 9 April, Waddell encountered daily counterbattery fire from communist guns ashore. The ship's gunfire, in turn, was credited with knocking out several counterbattery sites. Most missions during this period fell in the area of the Cua Viet naval base and in Quang Tri province north of the Cua Viet Kiver. At times, the range was so short that Waddell could observe her own fall of shot. Late on the afternoon of 8 April, Waddell took a "high priority" target under fire, and received heavy counterbattery fire in return. A secondary explosion ashore attested to the fact that Waddell's shells had hit something-but the enemy stubbornly kept up the fire, landing a shell very close to the destroyer's bow. A surface burst damaged the ship's ASROC launcher, and shrapnel littered the destroyer's deck. After renewing her guns at Subic Bay-they had been so worn by combat operations during April- Waddell returned to Vietnamese waters to join TU 77.1.2 in Operation "Linebacker." For two weeks, Waddell made continuous gunnery strikes at night and sometimes encountered the fiercest return fire she had thus far experienced. She silenced some enemy batteries while picking up some shrapnel in return from near-misses by the communist guns-before she shifted to waters off the DMZ, where she supported ARVN operations until 26 June. Her final two weeks of this WestPac deployment were spent on "Yankee Station" planeguarding for Coral Sea. After sailing back to the United States-via Yoko-suka-the ship underwent an extensive yard period. She spent the waning days of 1972 preparing for another deployment to the Far East, one which was different from the previous ones. For by this point, American land, sea, and air forces were no longer committed in active combat roles in Vietnam. Thus, she conducted only training operations in the Gulf of Tonkin in February 1973, before she visited Beppu and Sasebo, Japan. Returning to the west coast on 2 August, Waddell spent the remainder of the year in exercises and local operations off the southern California coast before again sailing for the Orient on 23 April 1974. Following the usual stops-Pearl Harobor, Guam, and Midway-she arrived in the Philippines on 16 May to conduct local operations out of Subic Bay. Subsequently, the ship participated in Exercise "Kangaroo I" near Shoalwater Bay, Australia, with units of the Royal Australian Navy. Following local operations out of Subic Bay and Kaohsiung, Taiwan, Waddell got underway for the west coast on 28 September 1974 and made port at San Diego on 18 October.